A Wedding Album - To Purchase or Not to Purchase? That is the Question! Preserving Memories - You may be surprised at the speed memories of your wedding will fade. While you may remember the emotion of the ceremony you will likely forget the details that made your wedding unique. With a wedding album, a turn of the page and your memories will come flooding back. Printed v Digital Copies - Viewing photographs on a mobile phone or computer screen just isn't the same as poring through the pages of a modern wedding album. You can't compare an image on a screen to a professionally printed wedding album. It's about the album experience of seeing your pictures printed on paper, being able to touch and feel the weight of it in your hand. The images in your album will be of a far better quality than the ones produced by supermarket chains like Tesco and Asda. Photographers work with professional print services to create images which although more expensive, use inks that do not fade and will last a lifetime. Like a Storybook - Framed photos only provide a glimpse of one specific moment and digital photos can be seen out of sequence due to the way they may have been saved. However, photographs are made to be looked at and when presented in an album, provides you the chance to see them arranged to show a complete view of your special day, from beginning to end, with a storybook feel. Time after time, your friends, parents, children and grandchildren can enjoy the story of your wedding day on anniversaries and family gatherings. Digital Copies Can be Lost - USB sticks, CDs and DVDs don't last for ever they get misplaced, scratched and broken. Also, how many times do we add to an ever increasing number of photos stored on a computer or i-device, seldom if ever, to be viewed again, coupled with the potential risk of hard drive failure or even accidental deletion. Crucially you will need to backup copies of your images and store them on separate devices and media - there is a another option, an album. 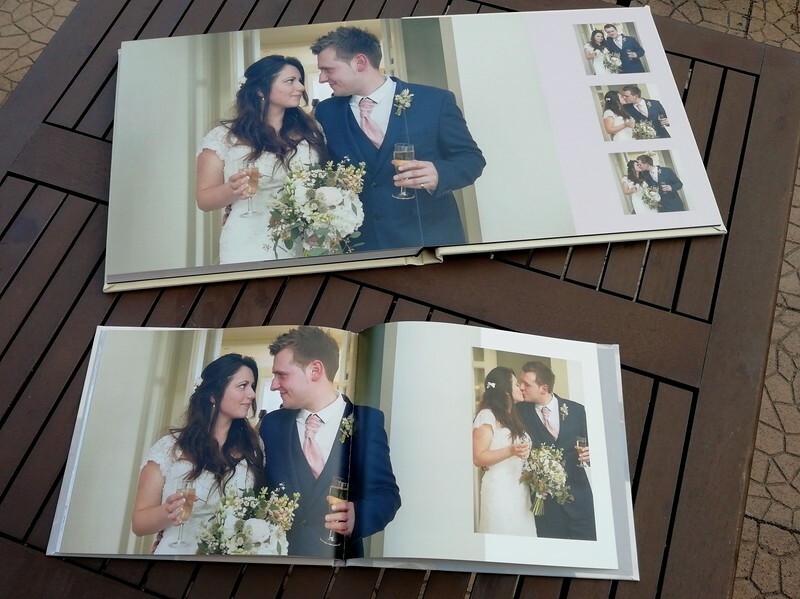 A wedding album is a permanent physical back up of the photographs on your wedding day, an investment, laid out sequentially to tell the story of your wedding - one that will stand the test of time for you, your children and future generations. Technology changes - Fast - Ask anyone of a certain age who had their wedding recorded on VHS tape and you will understand what I am getting at. With the pace current technology is advancing you may well be unable to play DVDs in years to come. While many couples may intend to have their wedding memories transferred to the next iteration of digital storage, sadly, it rarely happens. By opting for an album no matter how much technology changes in the future you can be sure your memories are safe. You're too Busy for a DIY Job - Buying a "Digital Only" package you might want to make time to sift through the hundreds of photos, picking the keepers and organising them in chronological order to skilfully tell the story of your shared love. However, you're most likely busier than you think. Time passes you don't get round to it and producing an album slips down your priorities. You have Options - Albums can amount to sums that seem prohibitive. However, not all options are eyewateringly expensive. Many photographers offer photobooks or storybooks which are coffee-table-style books and are much more budget friendly. The very highest quality album can amount to the thick end of two thousand pounds but flush mount, lay flat albums printed into heavy card are a beautiful mid-range option. Lay Flat Wedding Album & Coffee Table Book.